Long, far and distant. That is the way all seems right now, I’ve seen it in my mind, felt it in my heart but it is not a reality yet. I feel the wind blowing hard lifting up the fabric wing. 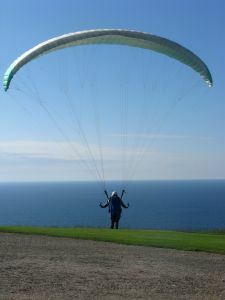 I would love to hang glide and soar high in the air, just like I have long to fly in different moments of my life. Sometimes to runaway and other to hurry things up and yet many times I just stand still. It is a quiet night and I hear nature sing outside the window, every once in a while a car passing by changes the tune but it soon become silent again. The darkness envelopes my senses and I wish I could fly to where my soul wants to be. I breathe in deeply waiting for the words to emerge and it is so unreal that as frequently I used to write, I don’t do it as I used to. I miss it. I always wonder over the fact that at times everything comes together so beautifully and as we treasure the moment we would like to linger with it for a while, maybe forever. I want that moment; when the altitude, the wind and my strength comes all together right before the take off. When all fear is left behind and excitement is free to move in. When the beauty of God’s creation is beneath me as I look around and see the majestic view. I know it will be hard to take all in at once and yet very possible to achieve. I can only imagine but one day my imagination will stop, and I will face reality and then, only then I will say I lived!! When in doubt look back at your own blog.